With the help of ABS-CBN Lingkod Kapamilya Foundation Inc. and Programa Genio, Elna M. Mallari of Philippine American Chamber of Commerce of Texas was able to help Floridablanca Elementary School, one of the schools in Pampanga which is located in a remote area. 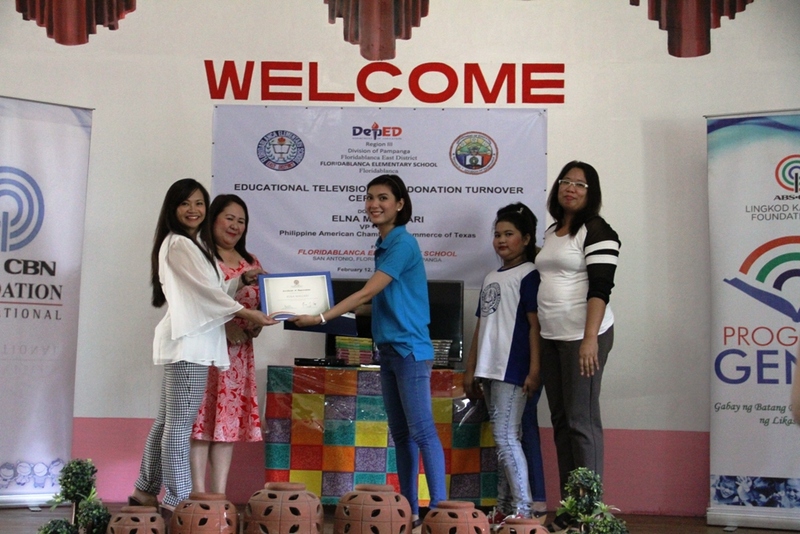 Last February 12, 2016, the school received an educational television set with DVD episodes of Epol Apple, Sineskwela, Math Tinik, Hiraya Manawari, at Bayani. Through Mallari’s magnanimity and her love to her Alma Mater, 2,168 students from grade 1 to grade 6 will be benefit from the ETV package and help the students learn through watching their lessons, aside from using the visual aids of their teachers. Teachers and students of Floridablanca Elementary School were prosperous enough that they were chosen again as one of the elementary schools in the Philippines that need help in terms of improving their educational system. At the same time, they prepared a short dance intermission number with gladness, to showcase their gratitude to the people who had helped them. Mallari was delighted that she was able to come back and help her alma matter. Katrina Constantino of ALKFI of Programa Genio was also thankful that they were given another opportunity to be an instrument to reach out and help one of the schools that is located in a remote area.